It is not common in Judeo-Christian and Islamic cultures for the sacred and the secular to come together. This is why among the Hebrew peoples musical forms such as piyyut and nigun have remained separate from (what became) klezmer, (just as gospel never mixed in with the Blues among the Christians and also why Sufi music remained separate in Islam). But the lines of both forms of music have always been blurred when it came to emotion and depth of feeling, especially in the keening melancholy and elemental ache of the ballad. And it has often taken the unique cultural geography of Israel to make for the melding of Middle Eastern musical influences – all of which can be heard on Pardes by Amos Hoffman and Noam Lemish. Mr Amos Hoffman is a virtuoso oud player who has been able to wring both tears of sorrow and joy from the twang of the strings of that instrument. And he does so with a great deal of mastery on “Argaman” just as he does when he bends and twists the notes of “Tchol Hamitpachat” on guitar. His wail is exquisitely tempered by Noam Lemish’s effervescent pianism here and elsewhere on Pardes. 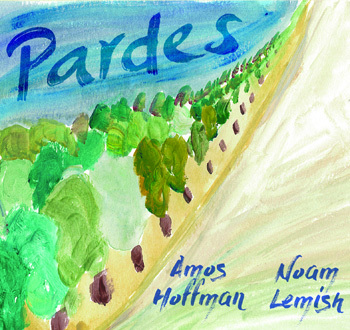 In fact, the fullest extent of the meaning of the title – in all of its Farsi glory, giving a multi-layered meaning to the word “Paradise” that is – is largely due to Mr. Lemish’s playing which is characterized by his delicate touch articulated in his way of making his fingers perform a kind of skipping motion of hands on the piano. The accomplished bassist Justin Gray brings just the precise amount of rumbling gravitas that is essential to anchor the music in profundity and give it a sense of almost epic storytelling. This makes for the perfect package, so to speak, as the music crosses many boundaries – both geographical (from Morocco and Israel to even far-flung Russia) and formal (merging, for example, the Ladino and the jazzy in an other-worldly metaphor) all of which makes this music at once accessible and unique. The glue that holds it all together from a rhythmic standpoint is Derek Gray, whose job can hardly be called easy – what with so many world-rhythms being called into the mix. Good fortune also comes in the form of the tombak player Pedram Khavazamini and clarinetist Jacob Gorzhaltsan who – between the two of them – grace several selections on this unusual, beckoning and highly recommended disc.